What led to Hitler and the Nazi Party being elected in Germany? In this day and age, it seems impossible that Hitler and his Nazi party ever even gained traction, let alone won a democratic election. The fact that the Nazis did not take Germany by force and were in fact elected by a majority vote comes as a huge surprise to many people. How could a party based on pure hate and evil win an election and be allowed to carry out genocide on some many groups of people both domestically and within other territories in Europe? Cause and effect had a large part to play in the rise and succession of the Nazi Party. The state of Germany post-World War I played a large role as well as external factors. Let’s look at how it was possible for the Nazis to have gotten into power through a democratic vote, despite the hatred they spoke out and the actions which accompanied such hatred of various groups of people; including the Jewish community, Homosexuals, Catholics, Black and Asian people, Gypsies and Communists. The early to mid-20th century was a time of utter chaos for Germany, economically, politically and socially. Germany was previously a monarchy, which was taken over by the Weimar Republic who suffered a huge recession and some of the worse hyperinflation in world history. After the war was lost, the German Kaiser (King) fled and the new democratic government was declared in the February of 1919. This was a huge political and social upheaval for the country and people were uncertain of the functioning of the new government body. Of course, this meant that Germany was in huge debt, hyperinflation followed and people were going hungry. 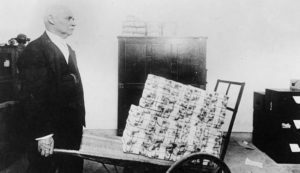 The inexperienced Weimar Republic decided the best idea was to simply print more money out to pay back their war-related debts. However, printing more money only makes the value decrease and soon German was declared in a state of hyperinflation. Famously, people claimed that they had to take a wheelbarrow filled with money to the shops just to buy a loaf of bread and by the time they got there, the inflation was so that they no longer had the correct amount. 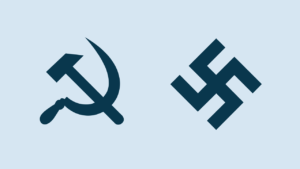 In Germany and other parts of Europe was a fear of Communism, Hitler and the Nazis played on this fear and basically gave an ultimatum – it was the Nazis or the Communists. In times of political, economic and social unrest, people tend to look to political extremes so these were the only plausible options. However, with the huge mass-spread fear of Communism present in Europe, the Nazis had the one up as the answer to the German people’s desperate prayers. Even the moderate parties which were not as popular as the Nazis looked to them for help in keeping the communists out of Europe. So not did they have the support of the people, they also had the support of less significant parties in Germany – despite their less extreme views. The Nazis were able to shift the blame of the state of Germany onto those who they claimed were not “true Germans”, these were mainly Jewish people. At this particular point in time, there was de facto segregation and Jews tended to live in closed off communities where they spoke Yiddish, worn traditional dress and ate different foods. This was just part of daily life in Germany, but the fear of the unknown and the ignorance of the uneducated was taken advantage of by Hitler. Because of the visible difference between protestant Germans and Jewish-Germans, the Nazis were able to create a suspicion amongst those who had never truly been exposed to the Jewish Community before. Consequently, the Jewish people were blamed for the poverty which was rife in Germany following the first world war, and this clearly spiralled out of control to the point where Jewish people were classed as a sub-human race and were murdered in their masses for no reason at all. Much of the Nazi propaganda caricatured Jewish people as “money-grabbing” and “greedy”. 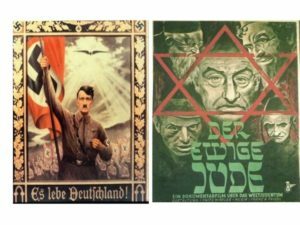 This imagery was used to heavily influence the way non-Jewish people saw Jewish people I Germany. Adolf Hitler has long been famed as a brilliant orator, despite his terrible crimes, he is credited with this. He managed to inspire and indoctrinate a large percentage of the German population, as well as others in Europe, into a regime based on Arianism and racial purity. In more than 5,000 powerful speeches over his career, he promised the people of Germany an epic empire which would reign for thousands of years. Hitler delivered his speeches passionately and with purpose, which grasped the attention of those who felt hopeless after the devastation that the second world war had on Germany. He acted as a figurehead which people could look to for hope and a regaining of German pride which had been knocked after their defeat in 1918. Perhaps the Nazis would have never become so popular if it was not for such a strong leader, so in part, Hitler’s communication skills and his message were a defining factor for their eventual election. For those who may not be aware, Hitler was not the founder of the Nazi party but they only started to become popular in the mainstream after he became heavily involved. 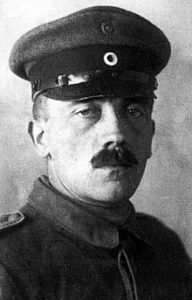 Hitler further acted as the perfect figurehead for the Nazi Party due to his time spent in the army and the military background of many of his supporters admiring this about him. He was seen as a martyr of the German people, who would get revenge for their treatment during and following World War I. In short, it seems people were willing to listen to him because he seemed to have all the right answers for a crucial time of great economic upheaval. Through Nazi rallies and the influence of Josef Goebels, the Nazi party became a marketing machine and used heavy propaganda to influence the public. Rallies were attended by thousands, caricatures, videos and imagery would be spread around Germany and the regime was being planted into people’s brains. No other regime has ever advertised so heavily. Whilst not always visible, the Nazis ruled with terror and the German people were scared not to vote for the Nazis. A famous story of a Swiss woman went to vote and chose another party, and she was shortly abducted from her home and beaten mercilessly. In fact, up to 10,000 unemployed men were given Nazi uniforms and told to beat up any opponents to the Nazi regime – and this created a very intimidating environment. All individuals lost their privacy and following 1933, officials could read people’s mail, listen in on telephone conversations, and search private homes without a warrant. In May 1933, Storm Troopers (SA) and police occupy the offices of trade unions. Trade union officials and activists are terrorized and all records are impounded and their assets seized. The unions are forcibly merged with the Nazi organization, giving the Nazis control over all employment. 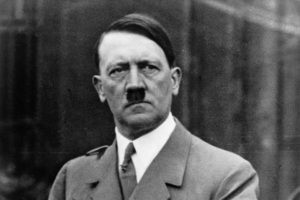 Like with any major events in history, the rise of the Nazi party was due to a combination of factors including a strong leader who took advantage of the terrible state that Germany was in post-World War One. Overall, it is important to keep the discussion of the authorities carried out by the Nazi part in World War II and the Holocaust specifically going so that history may never repeat itself in a similar fashion ever again.